Happiness can be found in simple day to day activities. Everyday pleasures are even sweeter when done in the nurturing cozy home environment. OK, I admit it - I am a homebody. As much as I love going out with friends and family; I would rather entertain at home. No matter where we travel, I always look forward to coming back to the sanctuary of my cozy home. Coziness may mean different things to different people. I have narrowed down the top 3 ways I create a cozy environment in my home. You know how I like faux fur in my home. It's everywhere. 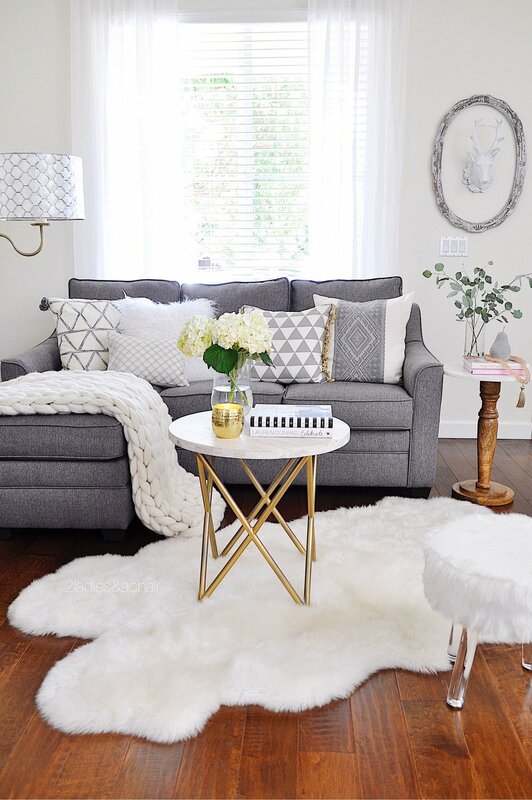 The textures of faux fur are so appealing for a cozy home. Whether it's walking barefoot on a sheepskin rug, cuddling on the sofa with a fur throw pillow, or putting your feet up on a furry stool the effect is the same: soft and cozy. I also like to vary the textures of fabrics I use in decorating. Velvet, suede, linens, and knits add so much to the texture and character of a room. The natural textures of a woven basket brings instant warmth to any room. Trending now in decorating is the use of tassels, fringe, and pom poms. I think utilizing all these small touches add up to creating interesting cozy spaces. Natural elements add so much texture for a cozy home. I especially love mixing natural elements together. This marble accent table with a wooden base is the perfect example. I was lucky to find this piece at HomeGoods. Layers, layers, and more layers! There is no better way to create a cozy home then using layers when you decorate. Rugs on the floor are an important place to start layering. Nothing feels better than stepping out of bed on to a cozy sheepskin rug! In the cooler months I love the look of multiple rugs layered on top of each other. Windows are another place to add a cozy layer to any room. Right now I have sheer linen fabric panels up to add softness and to let as much sunshine in as possible into my home. Place cozy knit throws and pillows of various textures together. I always use down filled pillows. Unlike synthetic pillows that are ridged and firm, when you sit against down pillows you sink into a relaxed comfy spot. I think you need to involve all your senses to create a cozy home. The smell of apple pie baking in the oven conjures up an immediate response, as does the crackle and smell of a wood burning fireplace. When we bought our newly built home, the first thing I did was install a fountain in the backyard. I love the sound of trickling water, so do the birds. The chirping of birds is another welcoming sound at home. We also hung a few wind chimes. Scattered throughout my home are scented candles. I don't like strong scents, but prefer soft light seasonal scents. In the summer I prefer citrus and floral scents. Fall is all about pumpkin scents. During the winter months I love the smell of cinnamon and vanilla; it brings the happy thought of fresh baked cookies! and you will add instant warmth and create a cozy home!